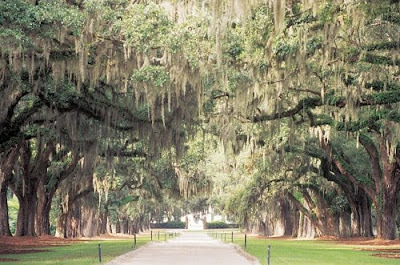 There are many things that turn me on about Charleston, South Carolina. It’s postcard gorgeous. It’s steeped in history. It’s utterly genteel…yet with a wily progressive streak. Don’t believe me? The county went blue in the election, has smoking ordinances (extremely rare in the deep South) and even boasts several new green housing developments such as Mixson (pictured below). But what what I may dig most is the food. Charleston is the epicenter of Lowcountry cuisine, a regional style of cooking found only on the coast of South Carolina and Georgia. Thanks to an abundant estuary system, Lowcountry cuisine features a rich variety of seafood. The marshlands also allowed for antebellum rice cultivation, making that grain another important staple. Signature dishes include Shrimp ‘n Grits, Hoppin’ John, Charleston Red Rice and She-crab Soup. My boyfriend, who grew up in Charleston, has made awe-inspiring Shrimp ‘n Grits for me several times, always with a voluble discussion of why only stone ground grits from Logan Turnpike Mill in Georgia are acceptable. Charlestonians do not lack opinions on their food. Back in 2005, my good friends Cameron and David – who live on Johns Island, one of several barrier islands flanking Charleston – took me to Charleston Cooks! This upscale kitchen store offers Taste of the Lowcountry classes ($25) in its demonstration kitchen. I was responsible for adding the cream to the rice pudding we made. After pouring EIGHT cups of cream in, I came to a full and proper realization of why Lowcountry cuisine is not for the health conscious. But even that can’t quiet my lip smacking. 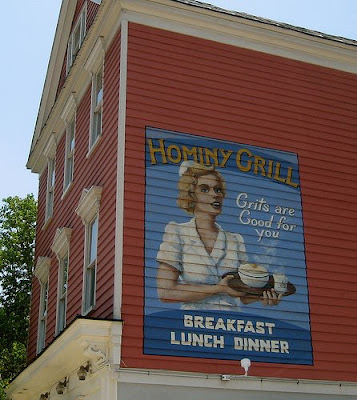 During the same visit, Cameron, David and I waited 45 minutes for brunch at Hominy Grill, the hallowed Southern restaurant located in a former barbershop. It was worth it for the Mile High Biscuits alone. This past year, Hominy Grill’s chef, Robert Stehling, won the James Beard Award for Best Chef from the Southeast. He was up against another famed Charleston chef – Mike Lata of FIG. When two of the five nominees are from the same city, you know it’s a foodie destination. 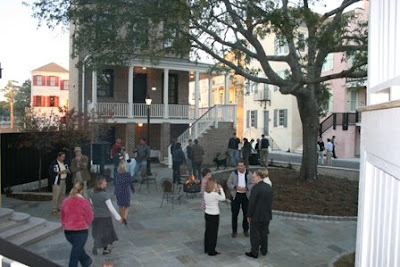 In fact, Travelocity named Charleston one of the top 10 culinary cities in the world. So what was I to do upon my third date with Charleston a few weeks ago? 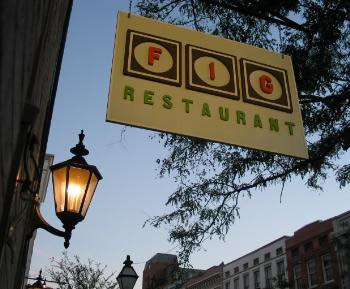 Go all the way, naturally, and insist to Cameron and David that we dine at FIG. And...wow. I have nothing short of adoration for Hominy Grill, but my meal at FIG proved to be far more (let's just say it) sensual. It was actually to the point where I was making involuntary murmurs of pleasure with each bite of my entrée. Fortunately, Cameron and David seemed to handle the embarrassment okay. 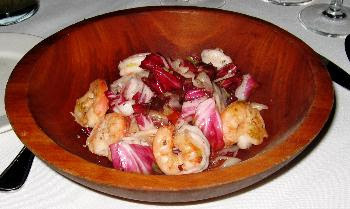 I started with the Warm Salad of Shrimp and Radicchio ($10) in a tasty pancetta vinaigrette (pictured below). Not bitter at all. (N.B. Even salads are artery-busters in Charleston.) Then there was the delicious “side for the table,” the Anson Mills Farro Piccolo Risotto with Broccoli and Country Ham ($7). Farro is a rare Italian wheat grain with a chewy texture, and one of the few American growers is South Carolina’s Anson Mills, an artisan mill that has revived several near-extinct varieties of corn, rice and wheat. I was starting to see how FIG was serious about sourcing high-quality local ingredients. But sweet nibblets! It was my entrée, the Crispy Caw Caw Creek Pork Shoulder ($27), that I am compelled to write home about. Just typing the words makes me salivate. It was served atop a puree of kabocha squash (the sweetest of all squashes), and let’s just say the kabocha contrasted mind-blowingly well with the incredibly tender, rich, salty, brick-colored pork shoulder, which I could cut with my fork. It was the single best meat dish I’ve had in years. Afterward, I had to know more about this Caw Caw Creek Farm. Turns out it’s a 90-acre sustainable farm in South Carolina that specializes in heirloom pastured pork. 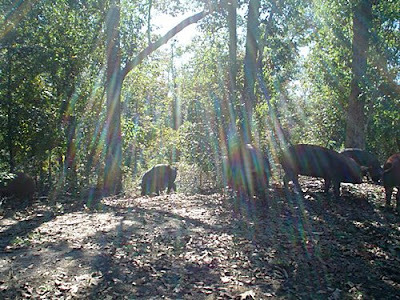 What that means is that the pigs roam freely through woods and pasture and do not receive any hormones, antibiotics or medicines. As a result, Caw Caw Creek pork is moister, tastier and redder in color. It resembles steak more than “the other white meat.” No wonder the farm supplies prestigious chefs like Thomas Keller of Napa's French Laundry. But boy would I risk it to eat this mythical dish once a month. Or if I was rich...once a week. Morton, when you get back to LA, you must check out Local: silverlakelocal.com.